Office Watercoolers. FREE Site Survey. If you are interested in one of our mains fed water coolers then why not take advantage of our free, no obligation site survey. How does the free site survey work? We offer a free site survey for all our floor standing and counter top mains fed water dispensers. The survey is completed by one of our fully qualified engineers who will assess your environment and agree with you the best location to site your dispenser and the necessary work involved. The survey is completed without obligation, therefore if you decide not to progress with the installation, you will not be charged for anything, it's completely free. If you decide that you would like to go ahead with the installation then our sales team will discuss and agree with you the most suitable dispenser for your needs, your payment plan and arrange an installation date that suits you. Why do I need a site survey? Mains fed coolers need to be plumbed into your existing water supply. In some cases additional plumbing may be required in order for us to site the cooler in your desired location. Our engineers will discuss this with you when they visit so you are fully aware of what will be involved. Am I entitled to a free site survey if I want to upgrade from an existing bottled water cooler? 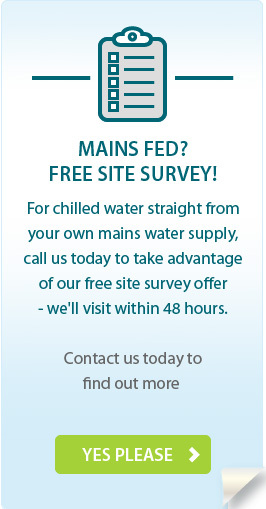 If you're an existing customer but currently do not have a mains fed cooler but would like one, then yes, you are eligible for a free site survey. Do I need a free site survey with a bottled water cooler? No, bottled dispensers simply require a power source, so they're portable and fit into most office spaces. Do I have to provide any credit card or payment details when arranging a site survey? No, payment details are not required. How do I arrange my free site survey? Simply call our sales team on 0845 609 0902 or complete the short enquiry form below. We'll call you back to arrange your site survey within 48 hours or at a time to suit you.